I’m not a huge fan of Martha Stewart but I love the gallery of pets in Halloween costumes over at her site. 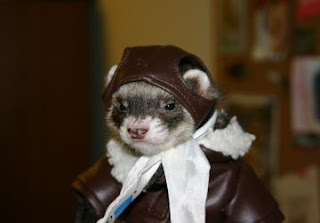 Tank, the fighter pilot ferret! Oh my god, the cuteness is unbearable. I look into those tiny black eyes and my heart melts. And the tiny ears! Popping out of the hat! The scarf! Everything about this just kills me. My entire day has been made by this little guy. I just wanna squeeze him and love him! Weeee!